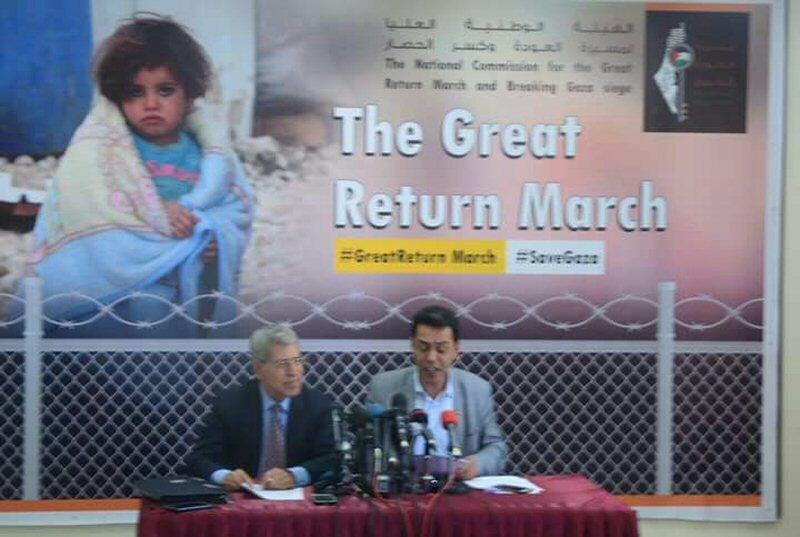 In a press conference, on Wednesday, at the Palestinian Ministry of Information, the Higher National Commission of the Great March of Return and Breaking of the Gaza Siege appealed the international community, at all levels, to urgently intervene on behalf of the Palestinian people in obtaining their basic human rights, and ending the dehumanizing and unjust siege on the Gaza Strip. “On 30 March, 2018, we, the Palestinian people in Gaza, launched a wide scale peaceful campaign: The Great March of Return in order to obtain our basic human rights, namely our right of return and to live in honor and dignity، by breaking the siege on Gaza,” the commission said. ‏The Gaza Strip has also been suffering a 12-year Israeli-imposed siege which is illegal, immoral, unjust and dehumanizing. In 2003, Baruch Kimmerling described Gaza as: “the biggest concentration camp ever,” the commission pointed out. The commission concluded, according to Al Ray, by appealing to the world and encouraging them to stand by the Palestinian people in attaining their freedom, independence and self-determination, and to call for the immediately lift the brutal siege imposed on the region. For detailed document, click here.